Where do the major parties stand on issues affecting women in the ACT Election? In the lead up to the 2016 ACT election, we wanted to ensure that gender equality and social inclusion are priorities for our candidates for Government. That’s why we released an election scorecard, ranking each major party on their responses to five key issues facing Canberrans. On 1 August the Executive Director of YWCA Canberra, Frances Crimmins, wrote to ACT Labor, The Canberra Liberals and ACT Greens asking for their responses on five key policy issues that address selected issues from the YWCA Canberra Election Platform: Every woman, every child, every day. Will your party prioritise ending violence against women by providing long-term, adequate funding to implement primary prevention programs into all schools in the ACT? Will your party support at-risk young people by developing a suitable, long-term alternative to re-engage young people in education or employment pathways, building on the lessons learnt from the successful Youth Connections program? Will your party commit to ending gender inequality, and adopt gender impact assessments across all areas of policy development? Will your party address the ongoing issue of homelessness for women by investing in the provision of single-unit, affordable housing for women of all ages? Will your party ensure the social inclusion of all Canberrans, and commit to funding increased community infrastructure in the Lanyon Valley? Committed policy – The policy was committed to in full. Partially met – The policy was partially met. Not met – The policy was not met. Parties were then allocated scores out of ten, with every ‘Committed policy’ being allocated a two, every ‘Partially met’ policy being allocated a one, and policies that are ‘Not met’ being allocated a zero. We consulted with all major parties prior to releasing these results, and ensured that they had multiple opportunities to respond and adjust their responses. The ACT Greens received a score of seven out of ten or 70 per cent for their responses to the scorecard. The ACT Greens released a $5 million domestic violence package, including $2 million across four years for primary prevention programs in ACT schools. 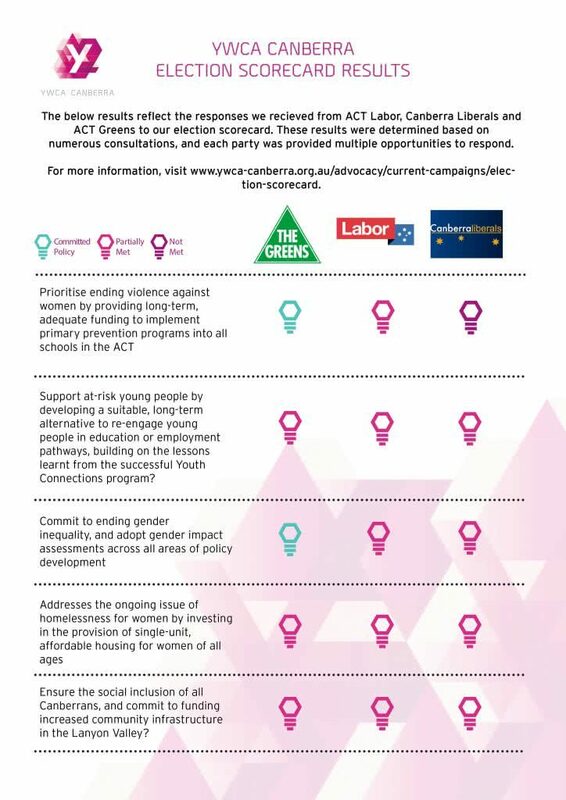 The ACT Greens also committed to government legislation and policies having gender impact assessments applied. ACT Labor received a score of five out of ten or a pass mark of 50 per cent for their responses to the scorecard. ACT Labor demonstrated some commitment across all five areas, but did not support any of the policies in full. The Canberra Liberals received a score of three out of ten or 40 per cent for their responses to the scorecard. The Canberra Liberals did not make any commitments for primary prevention programs for ending violence against women. The Canberra Liberals did commit to $800,000 in funding to Communities at Work Reach Home Program for women escaping domestic violence and to a one off $25,000 grant and ongoing grant of $75,000 for the Computer Clubhouse. To find out more about the scorecard, see the verbatim answers provided by the parties in full, and learn more out our scoring process, download the full document below.